SAN FRANCISCO (AP) — Volunteers around the world collected nearly 9 million pounds of cigarettes, bottles and other trash during a coastal cleanup campaign last year, according to a report released Tuesday. The garbage was picked up by nearly 600,000 volunteers who scoured more than 20,000 miles of coastline on Sept. 17 for the 2011 International Coastal Cleanup, according to the Ocean Conservancy, which organized the 26th annual event. The top five types of trash found were cigarettes, beverage lids, plastic bottles, plastic bags and food containers. Volunteers found 94,000 balloons, 267,000 items of clothing and 940,000 pieces of food packaging, the report said. "Our volunteers picked up enough food packaging for a person to get takeout for breakfast, lunch and dinner every day for the next 858 years," Ocean Conservancy CEO Vikki Spruill said in a statement. "Ocean trash is human-generated, preventable and one of the biggest threats to our ocean and waterways." Spruil said people should take responsibility for their trash by discarding it properly and using reusable bags and containers. Thousands of marine mammals, sea turtles and birds are injured or killed by ocean debris every year, conservationists say. Over the past 26 years, the annual cleanup effort has led to the removal of 153 million pounds of garbage from beaches, coastlines and waterways around the world, according to the Ocean Conservancy. In addition to ordinary litter, the Pacific Coast of North America could soon be hit with debris from the massive earthquake and tsunami that struck Japan last year. The National Oceanic and Atmospheric Administration said recently that tsunami debris could reach Hawaii this winter and the western United States and Canada in 2013 and 2014. Labels: Beach Trash, Impacts on Marine Life, International Coastal Cleanup, Ocean Conservancy, Top Five Littered Items, What Can You Do? The European Commission is to publish proposals in the spring designed to reduce the number of plastic bags used in Europe each year. Most of the 15,000 people who took part in a public consultation favoured an outright ban - but what are the options? Every year 800,000 tonnes of so-called single-use plastic bags are used in the European Union - the average EU citizen used 191 of them in 2010, the Commission says, and only 6% were recycled. 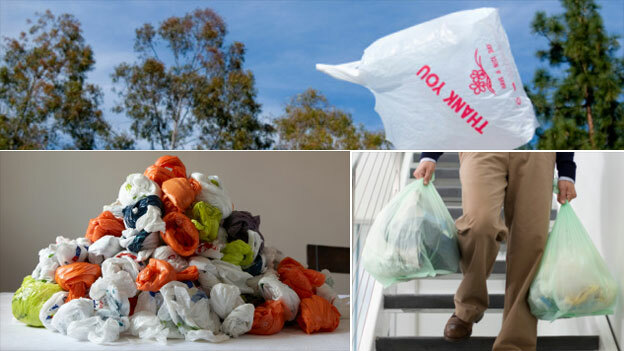 More than four billion bags are thrown away each year. "The impact of this plastic waste can be seen littering our landscape, threatening our wildlife and accumulating as 'plastic soup' in the Pacific Ocean, which may cover more than 15,000,000 sq km," says Environment Commissioner Janez Potocnik. So what are the options for addressing the problem and where have they been tried? Last year Italy became the first country in Europe to ban non-biodegradable single-use plastic bags. A number of countries have banned very thin plastic bags, including China, South Africa, Kenya, Uganda and Bangladesh - in Bangladesh's case, it was found that the bags had clogged up the drainage system, exacerbating deadly floods. A handful of countries have banned plastic bags altogether, including Rwanda, Somalia and Tanzania. The United Arab Emirates, concerned about pollution and the risk to camels and other animals, is bringing in a ban on all non-biodegradable bags next year. British government minister Lord Henley said last year he was "not happy" the use of carrier bags in the UK had risen by 5% in 2010, after four years of decline. He suggested the UK might introduce a ban. Friends of the Earth are in favour of this as long as alternatives are adequately highlighted, people and shopkeepers have enough time to prepare, and it does not have a "disproportionate impact on the poor". In the US, local laws muddy the picture. "The city of Los Angeles doesn't have a ban but Los Angeles county does," says Ted Duboise, who runs the Plastic Bag Ban Report website. "There is a lot of confusion. You can go to one supermarket and they will have bags and a few miles down the road they're banned." The Republic of Ireland introduced a charge of 15 euro cents (12p, 20 US cents) per bag in March 2002, which led to a 95% reduction in plastic bag litter. Within a year, 90% of shoppers were using long-life bags. The levy was raised to 22 cents in 2007, after evidence showed that the number of plastic bags used annually had risen from 21 per person immediately after the ban to 30 (compared with 328 previously). By this stage, the government had raised 75m euros (£62m, $99m) from the levy, which was put into an Environment Fund and used to reduce waste or research new ways of recycling. Belgium, Germany, Spain, Norway and the Netherlands are among the countries following Ireland's lead. Wales introduced a levy of 5p (six euro cents, eight US cents) per bag last year and Northern Ireland will do so next year. Wales also threatens shops that continue to give out bags free of charge with a £5,000 fine. Jennie Romer, a US lawyer and founder of plasticbaglaws.org, says: "Ireland's plastic bag levy is still widely regarded as the most successful charge on plastic bags, in part because the amount of the levy is relatively high and is adjusted based on per capita plastic bag usage." If shoppers stop using plastic bags, they must start using other kinds of bags, but there is no perfect solution. Stronger, heavier bags, whether made of fabric or plastic, have a bigger environmental impact than standard supermarket shopping bags. Last year Britain's Environment Agency published a Life Cycle Assessment of Supermarket Carrier Bags, which concluded that long-life bags have to be reused a number of times if they are to be environmentally a better option than standard plastic carrier bags. For instance, if a plastic bag is used just once, then a paper bag must be used three times to compensate for the larger amount of carbon used in manufacturing and transporting it, a plastic "bag for life" must be used four times, and a cotton bag must be used 131 times. If a plastic bag is reused, of course, then its carbon footprint per use decreases further - and the number of times the alternatives have to be used to match this low footprint is multiplied. The study took into account the fact that long-life bags are bigger than plastic carrier bags, and that fewer are needed for a weekly shop. Whatever type of bag is used, the key to reducing the impact is to reuse it as many times as possible either for shopping or as a bin liner. In 2010, a study by the University of Arizona also claimed reusable grocery bags could be a "breeding ground for dangerous food-borne bacteria and pose a serious risk to public health" - though it has to be noted that this work was funded by the American Chemical Council, which includes several plastics manufacturers. A scientist at the US-based Consumers Union criticised the study, saying that the same amount of bacteria could be found in an average bag of salad. The European Commission is considering introducing better ways of labelling biodegradable and compostable bags. Symphony, a British company which manufactures oxo-biodegradable bags, claims it can be "programmed" to biodegrade within six to 18 months. Symphony's chairman, former Conservative MP Michael Stephen, told the BBC: "There is a huge patch of plastic particles roughly the size of Texas swirling about in the north Pacific. If those bags had been oxo-biodegradable they would have disappeared by now." But Ms Romer of plasticbaglaws.org says: "The term biodegradable is often misleading, which prompted a bill recently signed into law in California prohibiting the sale of most plastic products labelled as 'biodegradable' unless the claim includes a disclaimer." Paper bags have been the traditional shopping bag of choice in the US, but while these biodegrade in landfill, the UK Environment Agency study points out that they have a higher carbon footprint than standard plastic carrier bags. It also says the available evidence suggests paper bags are not generally reused, either as bin liners - a purpose for which they are not well suited - or for other purposes. Mr Duboise of the Plastic Bag Ban Report website says pressure from the "powerful wood pulp industry" is one reason paper bags are used in the US. Over the years, supermarkets drifted towards plastic bags, he says. But, he adds: "A lot of supermarkets are going back to paper bags even though the environmental people say it's just as bad as plastic." In late February, French lawmakers voted to ban the use of Bisphenol-A (BPA) in all food packaging. It was a gutsy move, putting the health of Europeans ahead of big-business interests. Better still, it may give the U.S. Food and Drug Administration (FDA) the nudge it needs to likewise vote to keep BPA away from Americans’ food and drinks. BPA, an industrial chemical so ubiquitous it has been found in the urine of 93 percent of Americans, according to the Endocrine-Related Cancer Journal, mimics the female hormone estrogen. In studies, it has been linked to reproductive problems, prostate and other cancers, and problems in fetal brain development. A recent study from Harvard’s School of Public Health found a link between behavioral issues in preschool-age girls and mothers with high BPA levels — the higher the mothers’ BPA levels, the worse their daughters rated on standard behavior tests. The FDA has said it will decide by March 31 whether BPA should be banned from all U.S. food and beverage packaging — not because of the French ban, which will make exports of U.S. products such as meats, juices and frozen seafood problematic, but because of a 2008 lawsuit filed against the FDA by the National Resources Defense Council (NRDC). The NRDC filed a petition with the FDA, asking it to ban the use of BPA in food packaging. According to the NRDC, the FDA, which is legally mandated to respond to written petitions within 180 days, ignored the petition, prompting the NRDC to file a suit, requiring it to respond. “Now, the FDA has agreed to give us an answer — 41 months after the petition was filed,” the NRDC’s Sarah Janssen wrote in a Dec. blog post. After baby bottles warmed in microwaves were found to release BPA into infants’ milk, the chemical was banned from bottles by the European Union and Turkey, among other countries, in 2008. Canada had already banned BPA in bottles in 2007. Denmark has banned BPA in all baby food products, and the entire Japanese canning industry has replaced its BPA resin can liners. The U.S., however, still allows BPA in baby bottles, though Minnesota, Connecticut, Wisconsin, Washington, Maryland, Vermont and New York have enacted state-level regulations against it. Colorado is working on it. While a desire to protect the most vulnerable Americans — infants — hasn’t been motivation enough for the FDA, hopefully money will be. The market for Florida’s juices to France alone is worth $21 million annually. … will be beverages, notably the Florida orange and grapefruit juice using plastic container; France is the second largest market for Florida juices with 21 million dollars sales. [sic] Imported beer will also be targeted by this action. In addition, any product that contains a plastic packaging or a plastic component may be affected by this law. Frozen seafood and meat products are most likely using BPA in their packaging, as well as packers for bulk dried fruit and dried legume. That means to say that it affects the majority of the manufactured, frozen and fresh products. U.S. brands including Eden Foods, Muir Glen, Edward & Son, Trader Joe’s, Vital Choice, Wild Planet Foods, Oregon’s Choice Gourmet and Eco Fish already use BPA-free containers for some or all of their products, and Heinz, Hain Celestial and ConAgra have begun a move in that direction, according to the report, suggesting there are already a number of models in place and ditching BPA isn’t terribly difficult or unfathomable. For smart companies, there’s even a marketing opportunity in it. Some believe fears about BPA are overstated, but the ease with which BPA levels in the body can be increased is well documented. A November 2011 Harvard study, for example, gave one group of volunteers canned soup for lunch and another group fresh soup; after just five days, the group eating canned soup had a more than 1,000 percent increase in BPA in their urine. Even within hours of a single meal, researchers saw a notable jump. The new French law will go into effect Jan. 1, 2014. Let’s hope a similar U.S. law follows shortly behind it.